The term “frozen conflicts” describes territorial disputes in locations that have neither a peaceful resolution nor armed hostilities. Frozen conflicts exist in Western Sahara and Cyprus, but the term often refers to Post-Soviet disputes. The 2014 Winter Olympic games in Sochi have given us an opportunity to showcase some of the frozen conflicts around the Black Sea: Transnistria, Abkhazia, South Ossetia, and Nagorno-Karabakh. 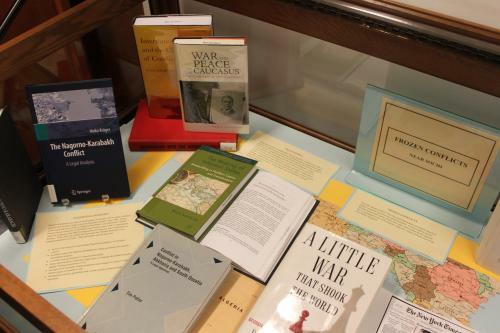 In setting up the exhibit we selected resources from our print collection, made use of digital images of archived New York Times articles, and consulted databases available to you from our Foreign, International and Transnational Law Resources guides. The display case is located on L1 as are a team of reference librarians who specialize in foreign and international legal research.